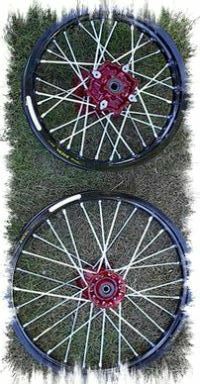 You can have Custom motorcycle wheels for any Year, Make, or Model. We can order any Excel or SUN Rim available and attach it to any hub needed whether it's an aftermarket hub or an existing stock hub that you provide us. You can choose rims from 10 - 21 inches in diameter along with a variety of colors including Black, Gold, Silver, Yellow, Blue, Red, and even CHROME rims!! We can build any size and color wheel that you want for any application or brand. 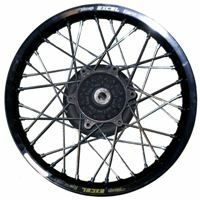 We specialize in building supermoto, motocross, and even pit/mini bike wheels with stronger lace patterns to withstand the highest racing demands. Our spokes are made from extremely high quality steel that are almost 2x thicker than average spokes with each spoke being hand cut, threaded, and bent for a perfect fit. Our man in the wheel department has over 30 years experience in building spoke wheels! He knows what works and what doesn't so relax because you're in the right place! The only aftermarket hubs available for Husqvarna are Talon Hubs but we don't recommend using Talon because Talon uses their own bearings and spacers. 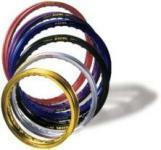 Stock bearings & spacers can be ordered from anywhere. 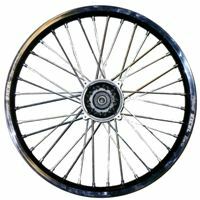 To get started, complete the Custom Wheel Order Form below with as much information as possible.